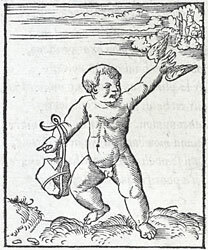 Alciato at Glasgow: Emblem: Paupertatem summis ingeniis obesse ne provehantur. Povrete empesche les grandz esperitz qu'ilz ne soient eslevez. Dextra tenet lapidem, manus altera sustinet alas. Me nisi paupertas invida deprimeret. My right hand holds a rock, the other bears wings. As the feathers lift me, so the heavy weight drags me down. By my mental gifts I could have flown through the heights of heaven, if malign poverty did not hold me back. Et n’a pour frequenter l’estude.